SUJA known about you a long time ago! Simplifying the array of store-bought juice in the market today has truly become a challenge! As the market has exploded with so many varieties that now it’s harder to figure out which one to choose. After juicing/blending EVERYDAY for almost 5 years now, I’ve learned from mistakes I’ve made in the past and learned how to do it the right way. 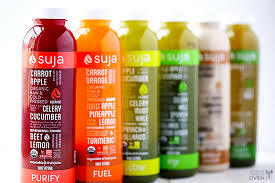 So to recently have found SUJA I was totally sold! As the way they keep the integrity of the juice. And honestly, there are days I cannot juice/blend so it’s nice to have some already made. So am thankful I’ve found SUJA juice as in my busy days, I can just grab and go! And I like the fact that this new company supports organic and sustainability. A famous blogger, Food Babe, said it best. Spreading awareness about how our food is produced and which companies we should support will change the marketplace! If you are interested in more detailed information on how to pick the best store-bought juice, read up on this link prepared by Food Babe. And here’s the link to SUJA. Previous Previous post: Island RAW Granola Now in KOKUA MARKET!